I'd like to take this opportunity to thank current and former colleagues for all their hard work on Google Apps at Loughborough - in particular Chris Beggs, Garry Booth, Mike Cardwell, Nikki Doyle, Graeme Fowler, Kathryn Latham, Hina Mistry, Vishal Nathu, Lee Preston, Lynne Render and Ricardo Twumasi. Loughborough University and Google have worked together closely during the 2009-2010 academic year to build a groundbreaking new “cloud” based productivity suite for students, in keeping with the University’s reputation for excellence in Student Experience. According to Chief Operating Officer Will Spinks, the partnership with Google encapsulates the mission to operate with maximum efficiency. “The introduction of the full Google Apps for Education suite has underlined that we can indeed offer an expanded and improved service for our students at a reduced cost. The two need not be mutually exclusive,” says Mr Spinks. “We have to work hard to maintain our leading position in this area and so we always look to be at the forefront when providing new facilities and services for our students,” says Vice Chancellor Professor Shirley Pearce. Loughborough students have their Google Apps account converted upon graduation into an alumni account. This means that students now retain their data on leaving the institution – including email, contacts, calendars and documents. An alumni email address is automatically created on initial registration, so that students are always able to quote their alumni address in correspondence, job applications and so on. Transition to alumni status takes place transparently through a single API call when the student’s registration lapses. The alumni Google account has been an unparalleled success, with over 5,000 users since its inception. Founded in 1909, Loughborough University is one of the UK’s leading universities, with a reputation for excellence in teaching and research, strong links with business and industry and unrivalled sporting achievement. Today the university consists of 17,000 students, 3,000 staff and over 75,000 alumni and is renowned for providing an excellent student experience, having topped the “Times Higher Education UK league tables for student experience” every year since 2006. Google Apps for Education is a free suite of hosted communication and collaboration applications designed for schools and universities. Google Apps includes Gmail (webmail services), Google Calendar (shared calendaring), Google Docs (online document, spreadsheet, presentation, and form creation and sharing) Google Video (secure and private video sharing – 10GB free) and Google Sites (team website creation with videos, images, gadgets and documents integration), as well as administrative tools, customer support, and access to APIs to integrate Google Apps with existing IT systems. When Loughborough’s email system came up for renewal in 2009, a student focus group was formed to explore the various options. The old system provided only email, but there was substantial demand for a richer platform for the student body to communicate and collaborate. It quickly became clear that very signiﬁcant expenditure would be required in order to provide a more fully featured system with enough storage to satisfy today’s “digital natives.” This would have been a very hard sell to senior management even before the global economic downturn, government spending cuts, and carbon savings targets. Having reviewed several options, the student focus group voted unanimously in favour of taking Google Apps forward, and a pilot was launched with 300 second year students in Autumn 2009. Feedback from the pilot was gathered in real-time using Google Docs, enabling the pilot group to view and respond to each other’s comments. 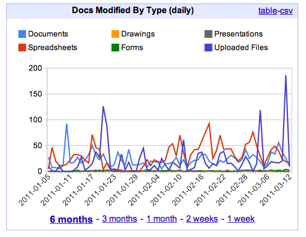 Following the successful conclusion of the pilot, the remaining students were migrated over to the Google Apps platform in December 2009 using Google’s automated tools. 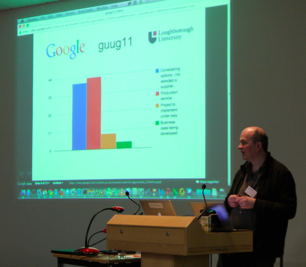 This is an area where there is much interest in the sector, and in February 2011 Loughborough University organized “guug11” - the first Google Apps for Education UK User Group meeting. 130 delegates from 70 institutions attended to learn more about the Google technology and what it could do for them. More information about the event can be found at http://guug11.lboro.ac.uk.